Whether you are paleo or plant-based, potatoes or mock-cauli-potatoes, are a staple at most Thanksgiving tables. Both are healthy for you. If you are paleo, it is important to eat a lot of veggies if you are healing a chronic condition. If you are vegan or vegetarian, you need healthy plant-based carbs and potatoes do the job! Both potatoes – and mock-cauli-potatoes – are delicious with gravy if you want to go the extra mile. 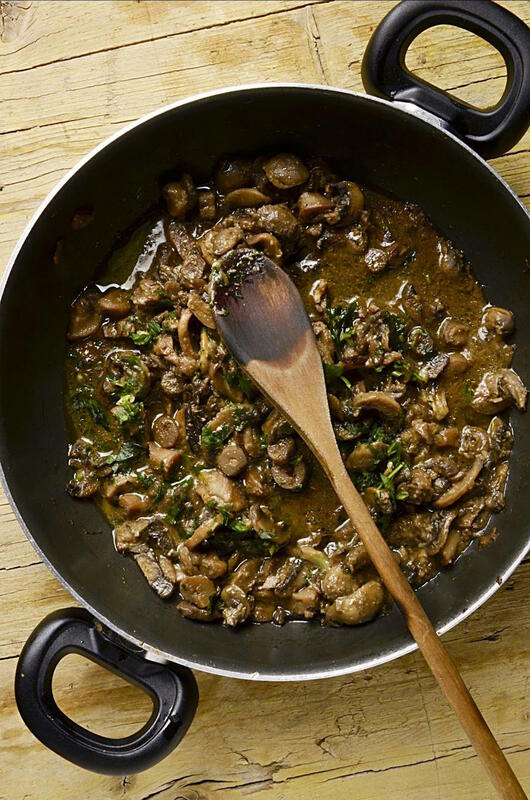 This is a great mushroom gravy recipe for meat eaters, vegetarians, and vegans! It is so good it could even be a side dish any night of the week! This recipe uses coconut aminos in place of soy sauce. Coconut aminos are a great non-soy alternative. Coconut amino’s come from coconut sap. They have a slightly sweet but also salty taste, very close to soy sauce. Like soy sauce, it is high in sodium so if you are watching your salt intake, please be aware. Coconut amino’s are easy to find in most any natural food store. I personally avoid soy-based foods since most are genetically modified and may be inflammatory. Better safe than sorry! Another benefit of this recipe is that it is free of corn starch. Corn is also typically a GMO food and even when organic, it’s hard to be confident that it’s not cross contaminated. Plus, corn in any form (organic or not) has the ability to feed pathogens like Epstein Barr Virus and Streptococcus. Since I am healed/healing from chronic Lyme Disease, I’m very careful at not feeding pathogens! 8 oz mushrooms, any kind sliced or chopped. Feel free to use a variety! Heat the oil in a large cast iron skillet over med-high heat. Add the onions, cook until translucent. Add the mushrooms, cook until tender (10-12mins). Add the garlic, rosemary, and thyme. Cook until blended. Add the wine and cook for 1 minute, stirring constantly. Stir in the broth and bring to a simmer. In a small bowl, whisk together the coconut aminos and tapioca flour to form a thick paste. Add the paste to the skillet, whisking constantly to dissolve the paste. Bring the mixture to a boil, cook for 2 minutes while stirring. Season with salt and pepper if desired and serve. Add all ingredients to your soup pot. Bring to a boil. Reduce heat and simmer for ~ 1 hour. Strain and enjoy!